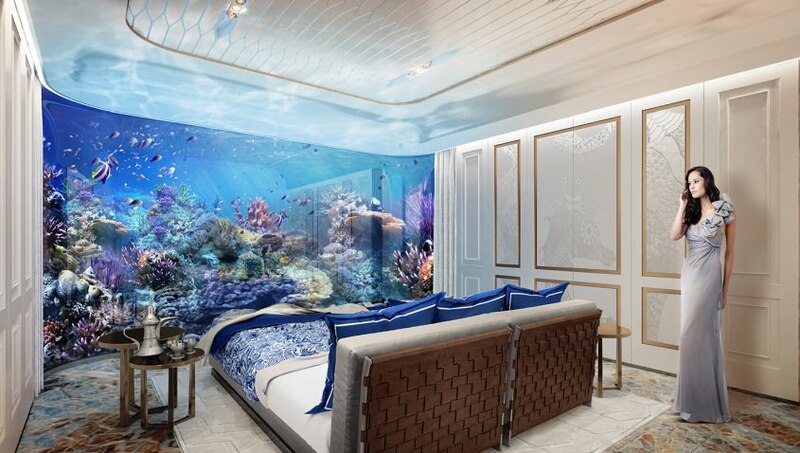 Imagine holidaying in a submerged room in the middle of a sea, or celebrating some special occasion with your family or friends in an unusual resort that goes deep under the water. 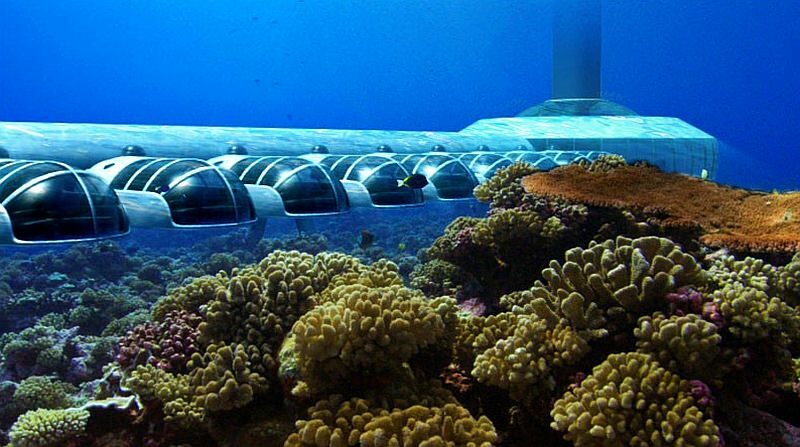 Well, this may not be a far cry anymore as technological advancements in construction technologies have paved the path for underwater architecture. 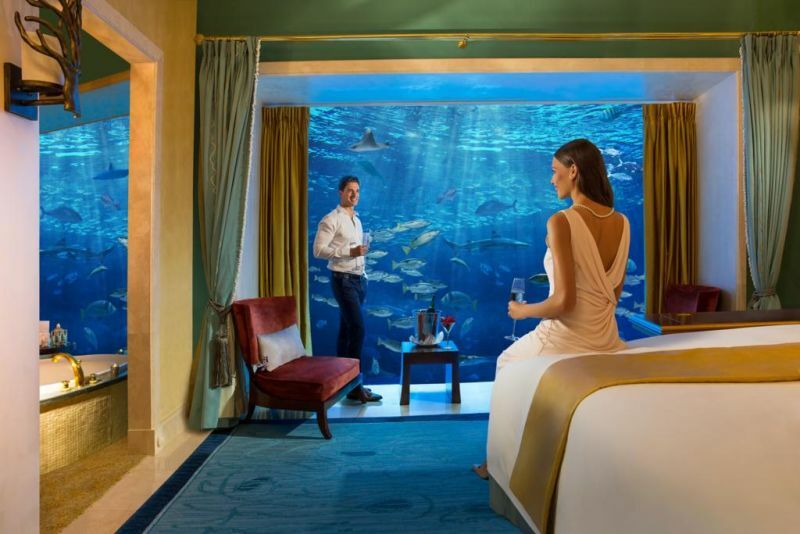 There are already a number of underwater hotel rooms running successfully today. 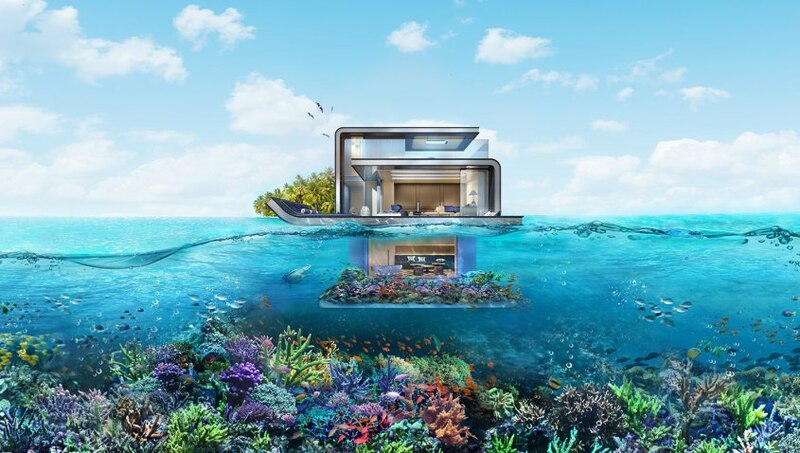 These underwater living structures are architectural gems that offer amazing and uninterrupted views of marine life while assuring comfort and safety. 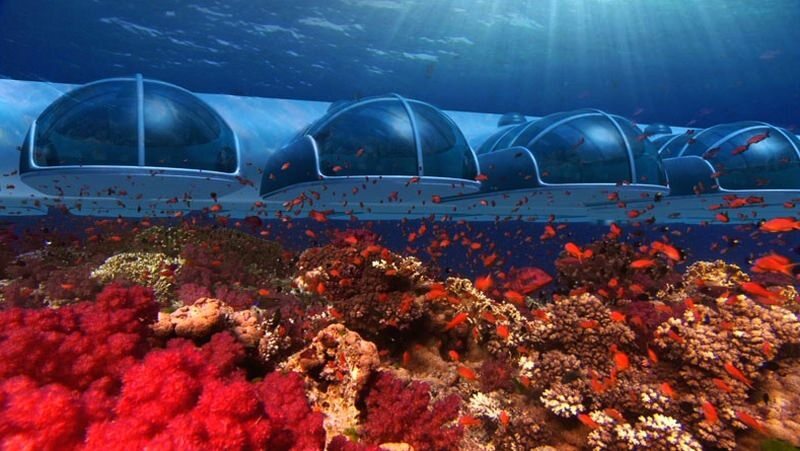 Let’s take a look at some amazing underwater hotels that offer a chance to sleep below the sea surface, up close to the marine life. 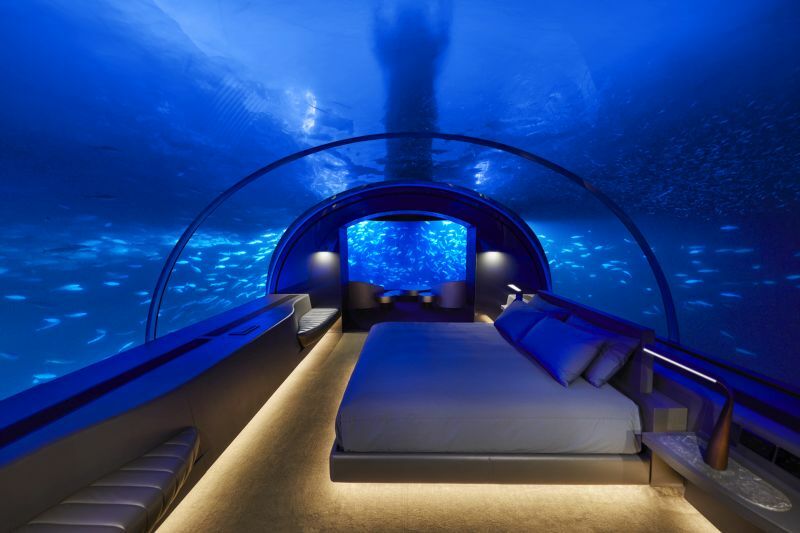 Located 16-feet below the surface of the Indian Ocean, The MURAKA underwater hotel suite at Conrad Maldives Rangali Island Resort is an epitome of luxury. 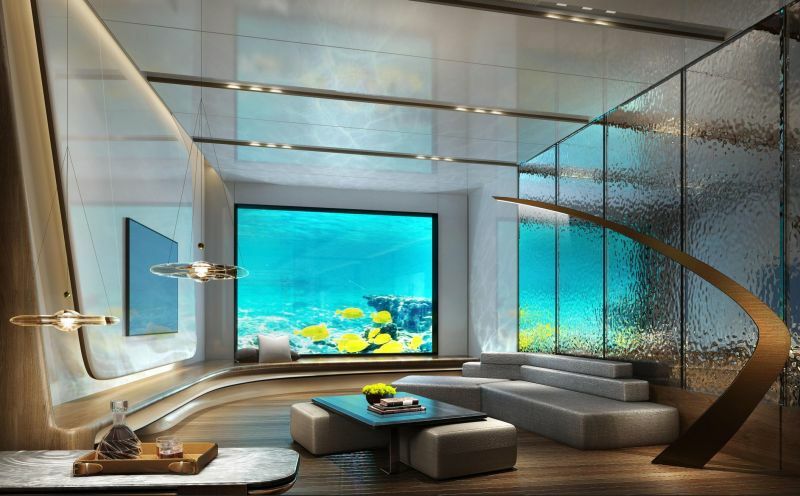 It is a two-story residence surrounded by specially designed glass walls to provide a view of the marine life. 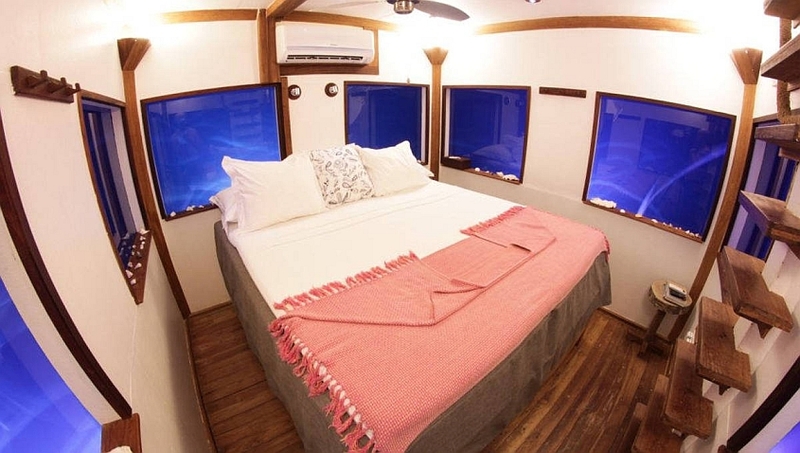 There is enough living space to accommodate up to nine guests. 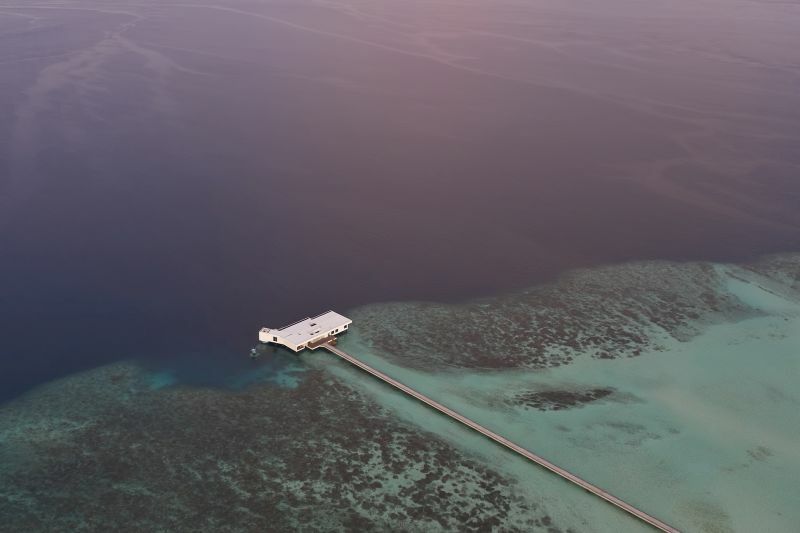 It is built out in the ocean, far from Conrad’s beach villas and guests are transported here through a private jetty. 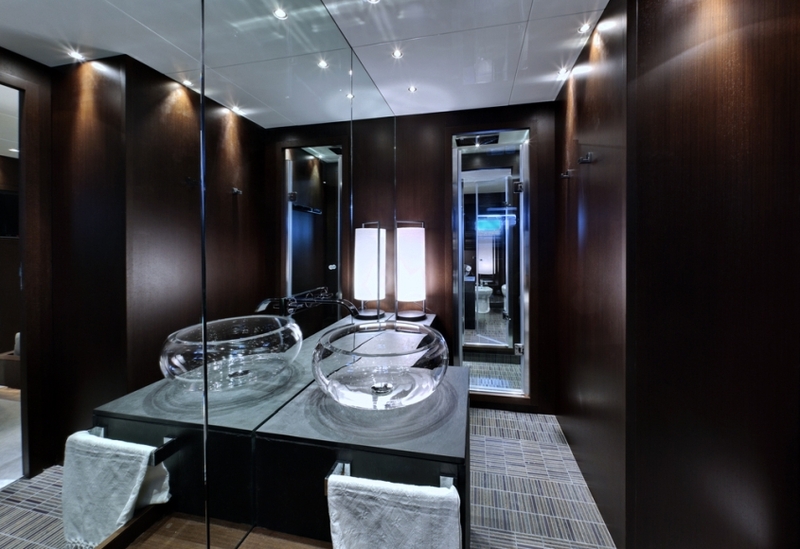 The suite comes with dedicated staff and luxurious amenities. 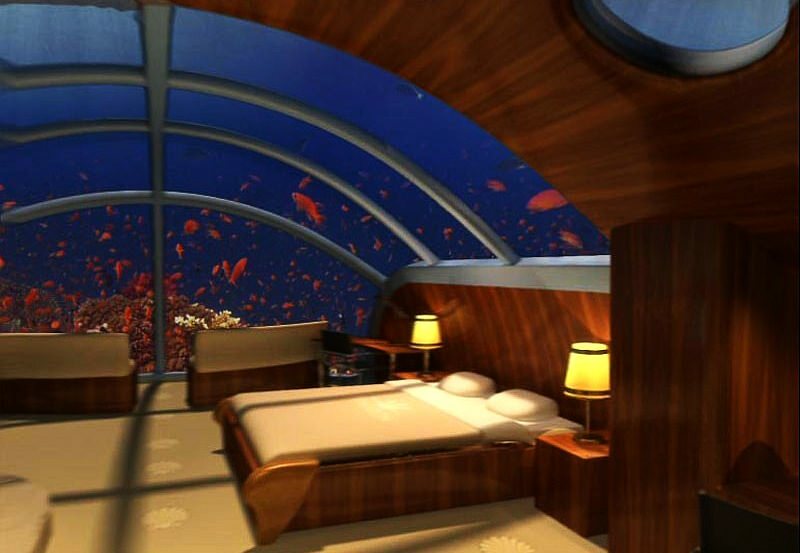 A heart-stopping holidaying experience waits for you at the World’s first underwater hotel room. 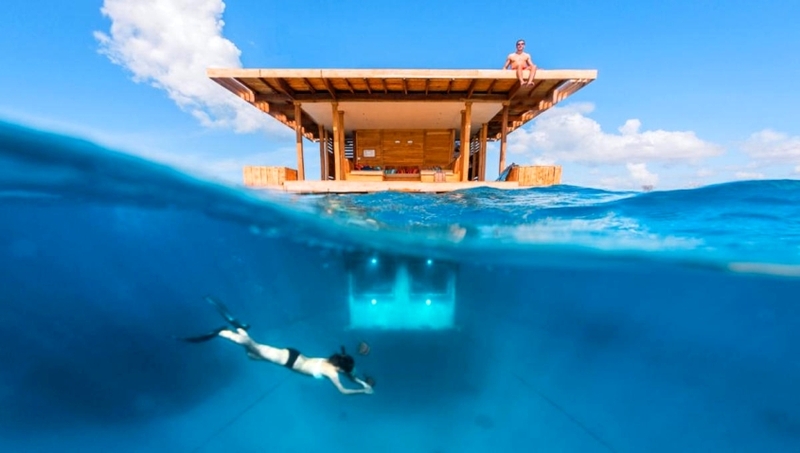 The houseboat-like Manta Resort off the Pemba Island, Tanzania has an underwater room for guests. 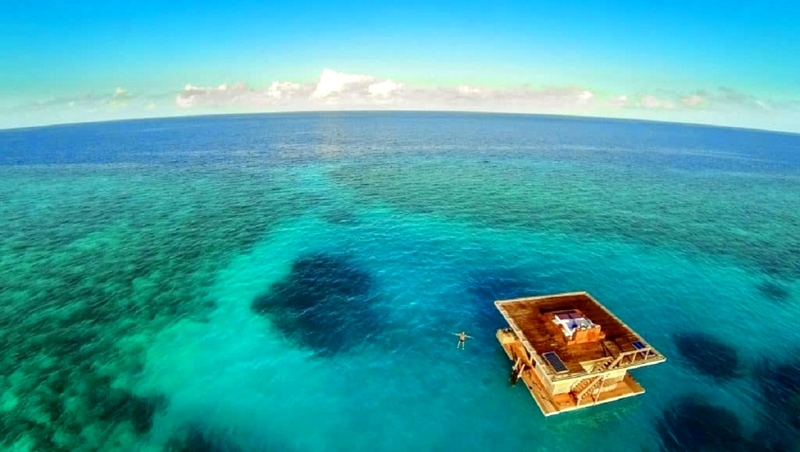 The room lies approximately 250-meters from the shore, with sleeping quarters submerged four-meters below the ocean surface. 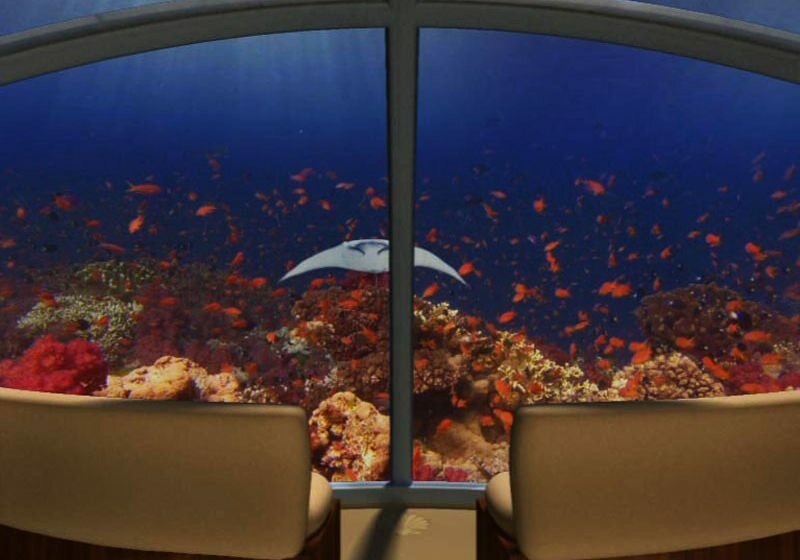 Visitors at Manta underwater hotel room can enjoy a 360-degree view of marine life in the Indian Ocean. 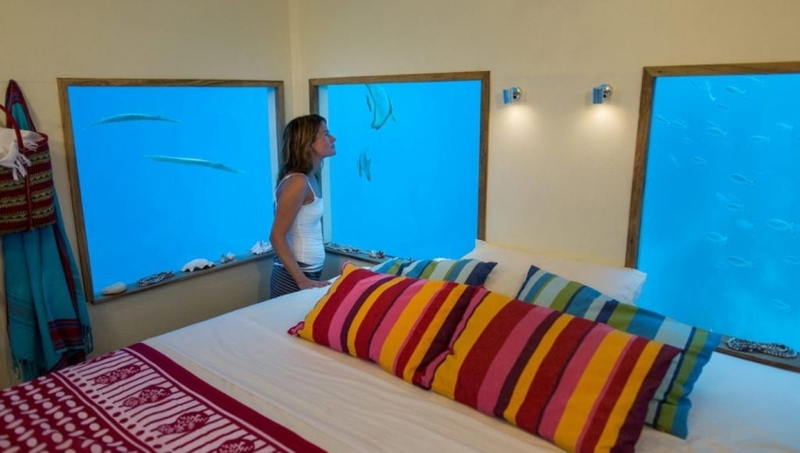 It is obvious to see coral reefs and different types of fishes swimming around the room. 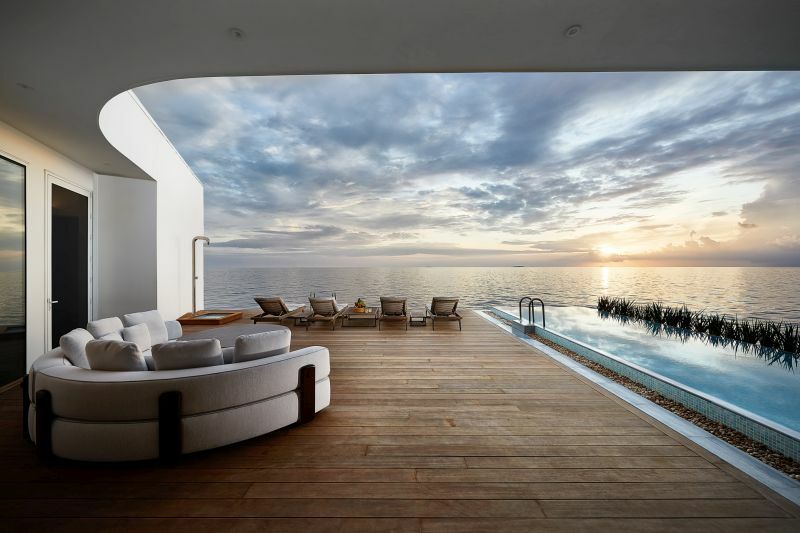 There’s even a lounge area and bathroom located on the sea level, as well as a rooftop deck for sunbathing or stargazing. 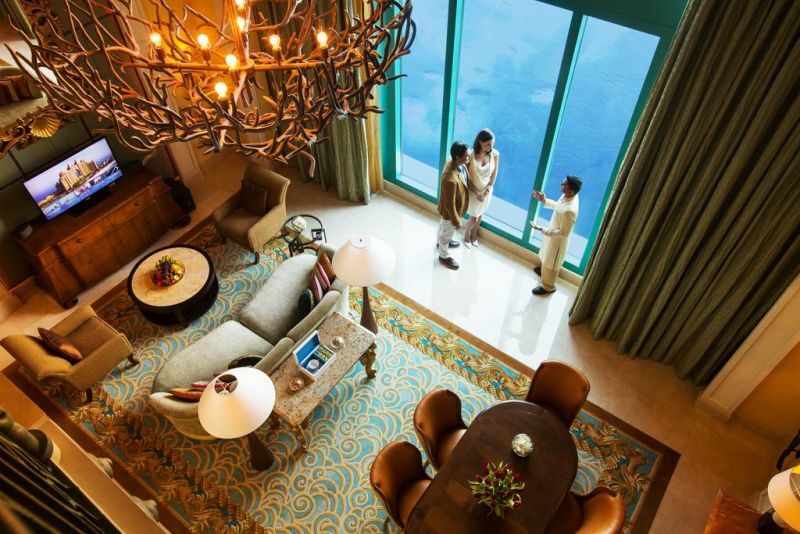 Located on Dubai’s Palm Jumeirah Island, the underwater suites at Atlantis feature floor-to-ceiling windows offering stunning views of the Ambassador Lagoon. 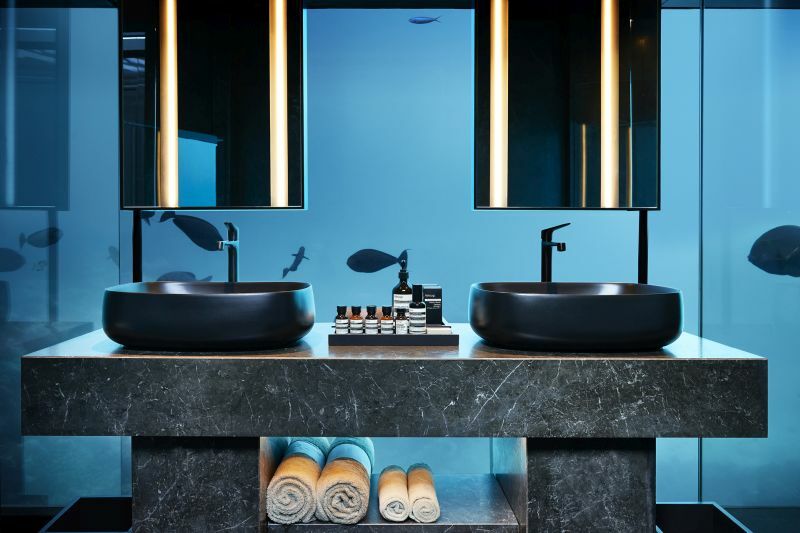 Named Poseidon and Neptune after the gods of the sea, these hotel suites have lavish facilities like a private elevator and 24-hour butler service. 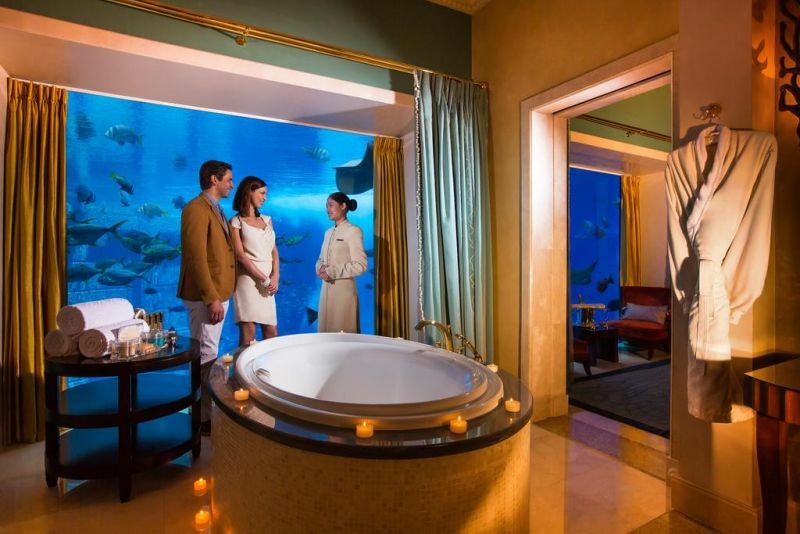 Guests can also relax in en-suite spa bath that overlooks the aquarium containing 65,000 marine animals. 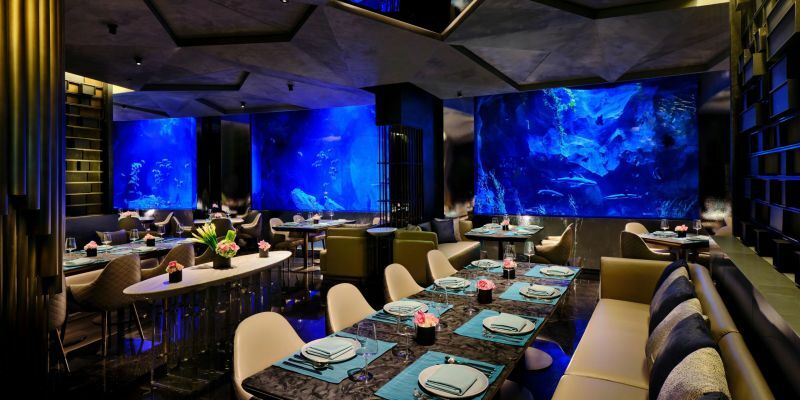 Shimao Wonderland Intercontinental Hotel in Songjiang district of Shanghai, China is an award-winning hospitality project designed by British architect Martin Jochman of JADE+QA. 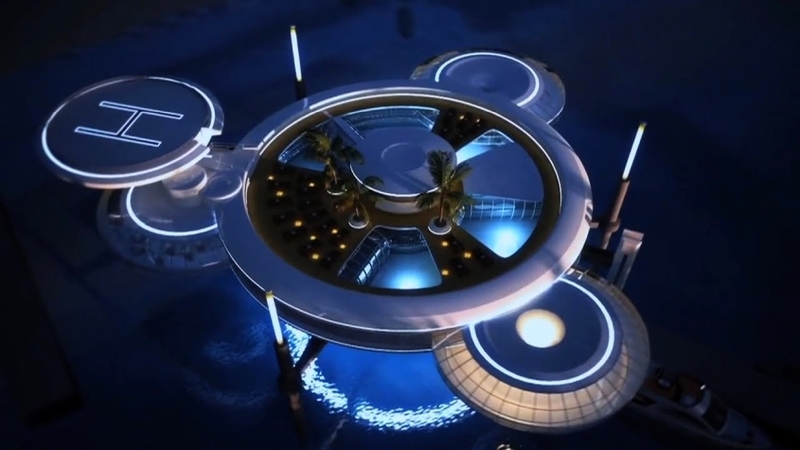 The resort has 18 stories, 16 of them are below the ground level and two of the lowest floors are underwater. 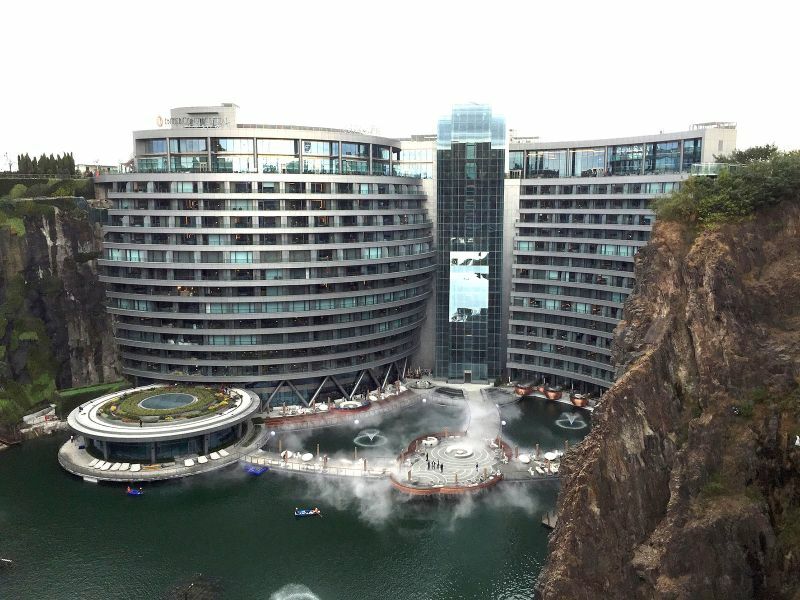 It is described as one-of-a-kind Groundscraper hotel in the world. 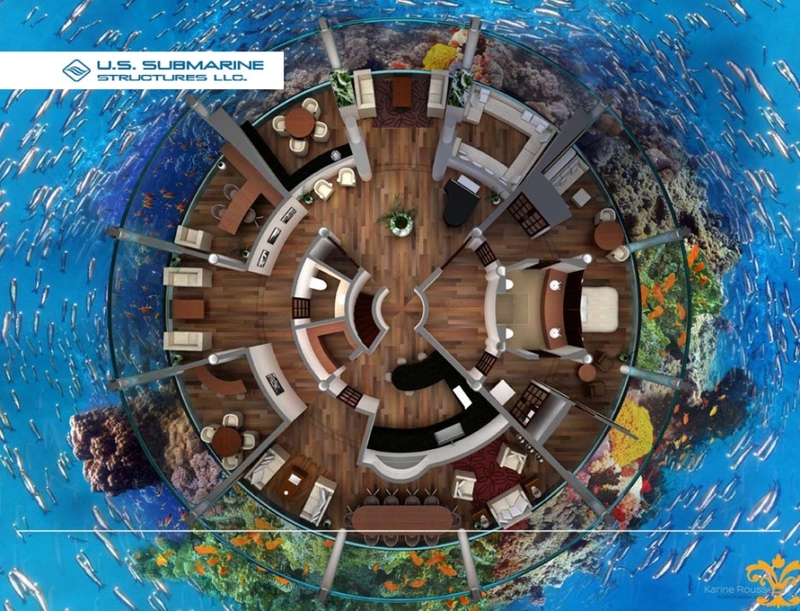 Previously an underwater research lab off the coast of Puerto Rico, the Jules’ Undersea Lodge in Key Largo, Florida now offers underwater lodging facilities. 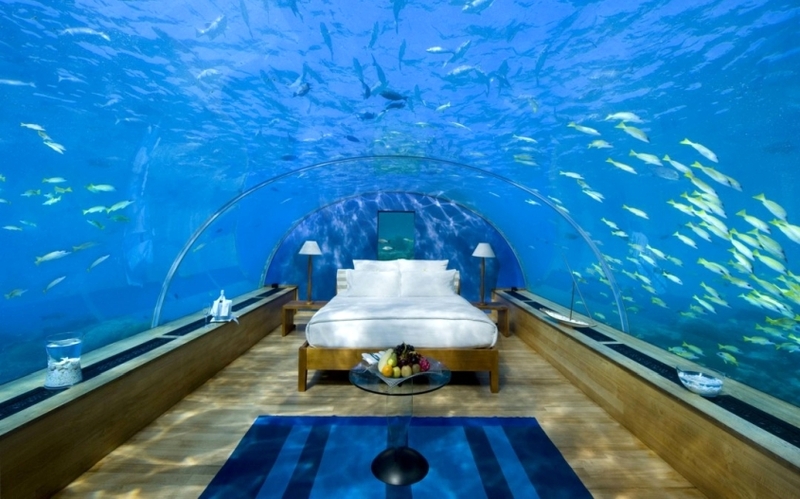 Its’ a shout out to scuba divers! 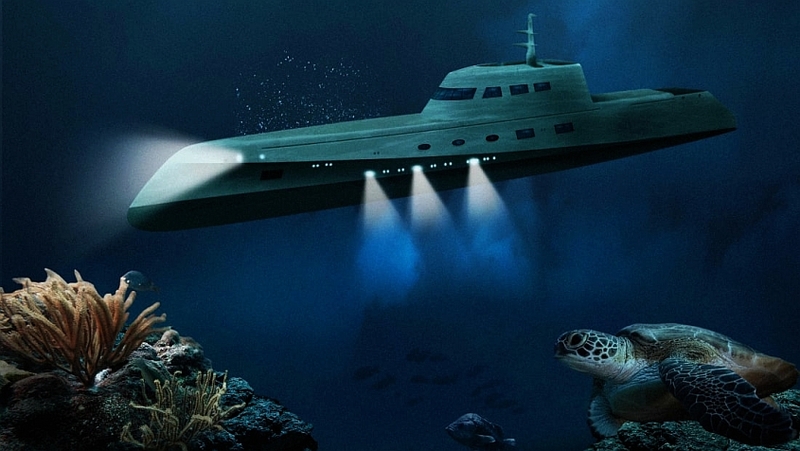 Guests have to scuba dive 21-feet beneath the surface of the sea to reach the lodge. 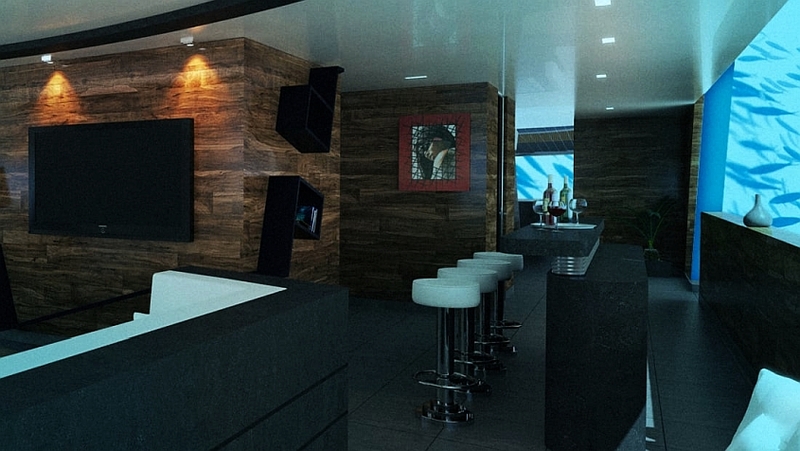 A 5 x 7-foot moon-pool entrance takes you inside the lodge. 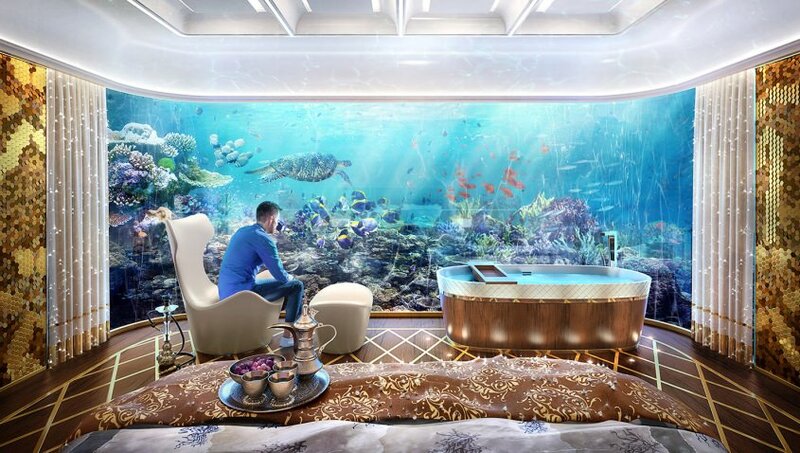 There’s a common room with kitchen and bathroom to one side, and two bedrooms with 42-inch round windows to gaze the marine life of the Emerald Lagoon, on the other. Believe it or not, there’s even a pizza delivery for an overnight stay. 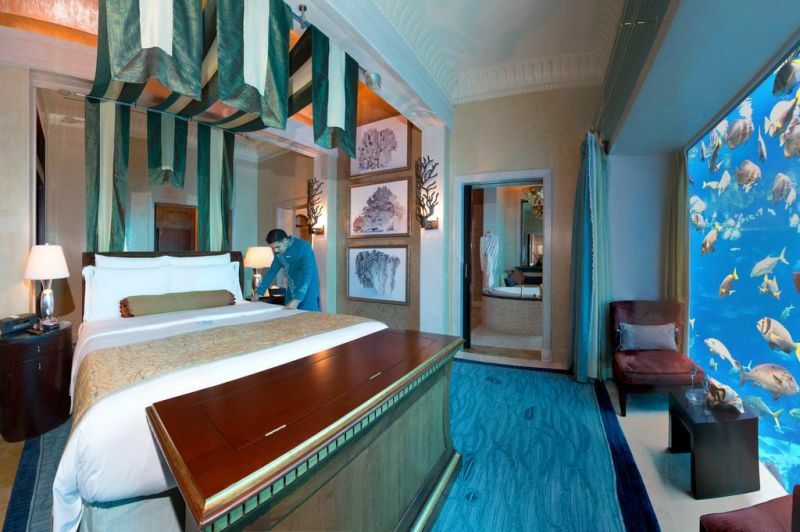 Price: Overnight stay for around $800 per couple. A three-hour tour for $150 per person. 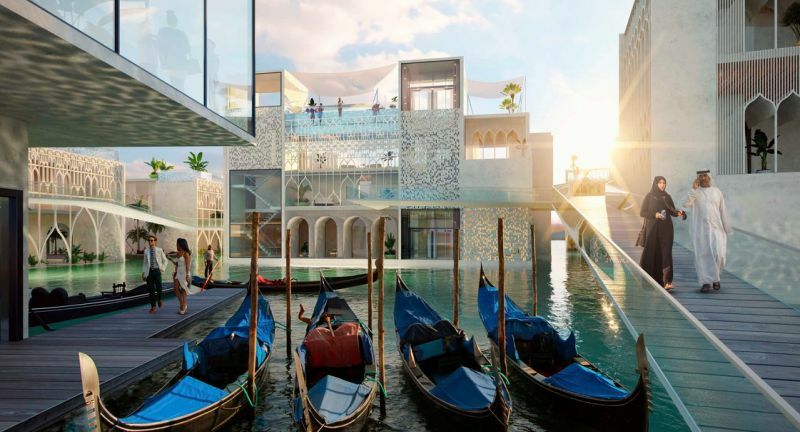 Dubai’s new underwater hotel will be modeled after the watery city of Venice in Italy, complete with gondolas and canals. 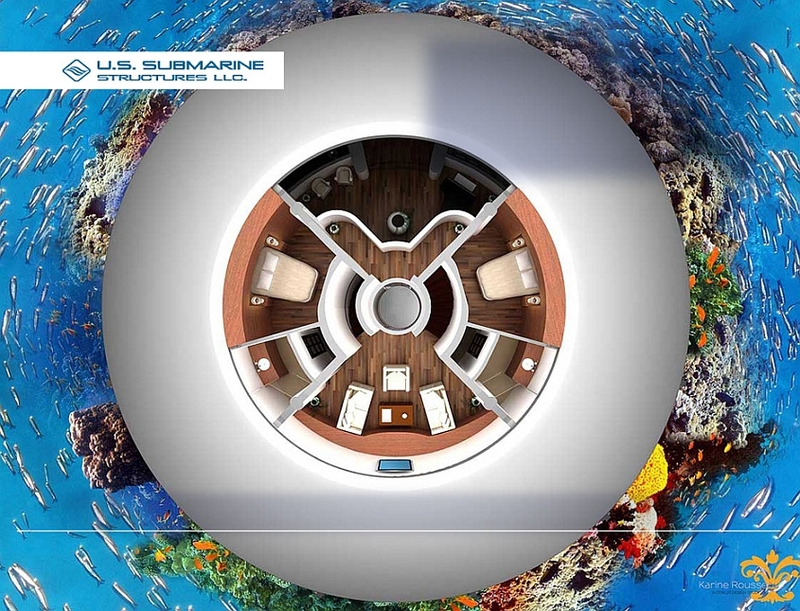 There will be 180 cabins underwater, each offering mesmerizing views of the sea. 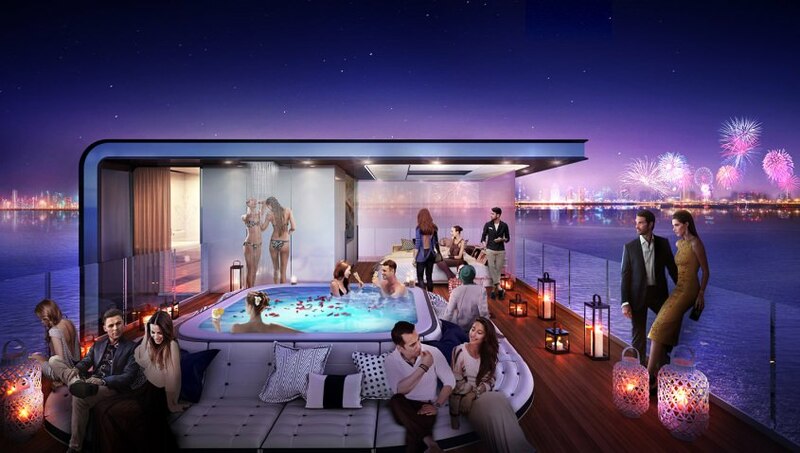 The biggest attraction here will be the underwater deck containing pool, guest cabins, restaurants and spa. 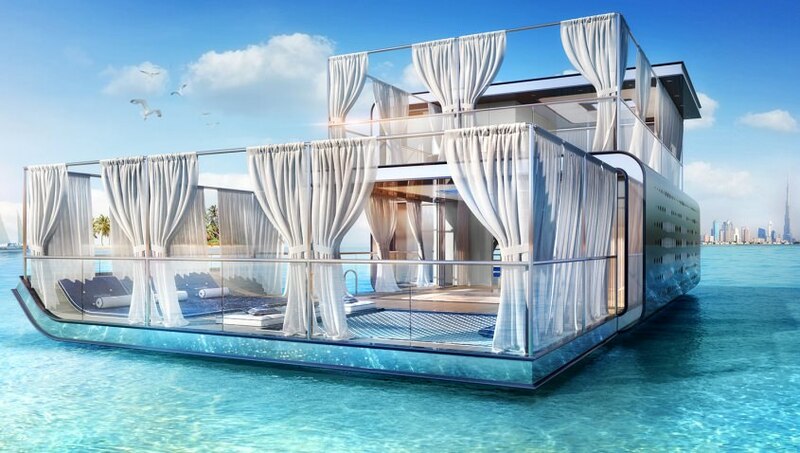 The global real estate and property developer Kleindienst Group is building these houseboat-like structures as part of the $5 billion hospitality project ‘The Heart of Europe’ in Dubai. 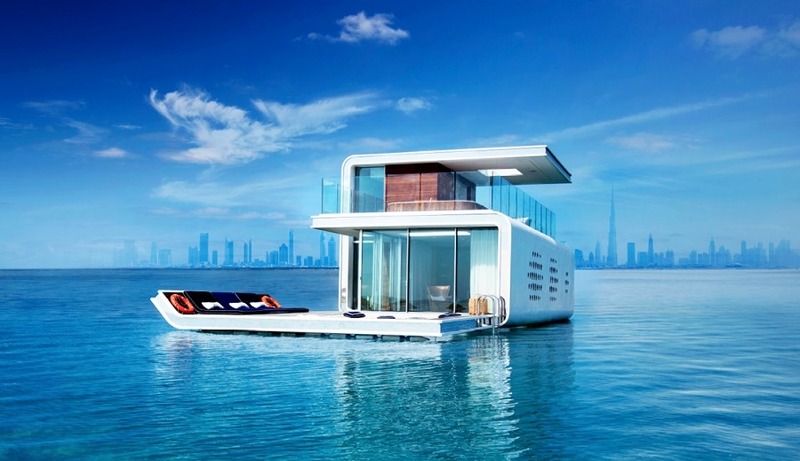 Aside from floating on the sea, these three-story floating villas have underwater accommodations for a unique undersea vacation in the middle of the Arabian Gulf. 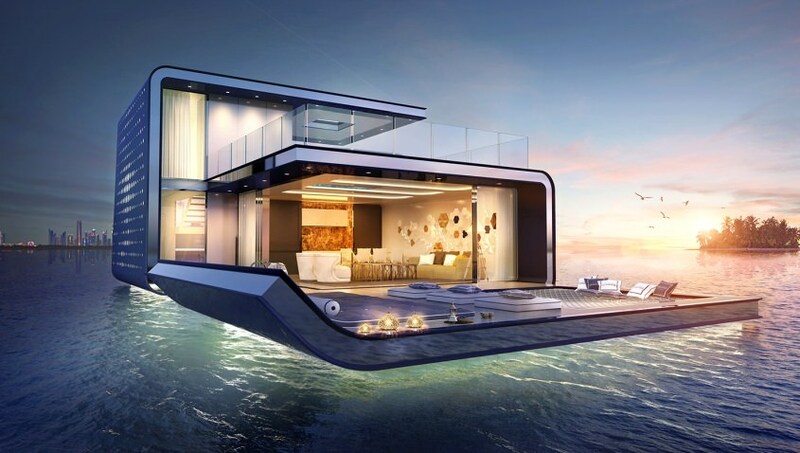 Each floating villa has a master bedroom and bathroom submerged in water to experience marine life. 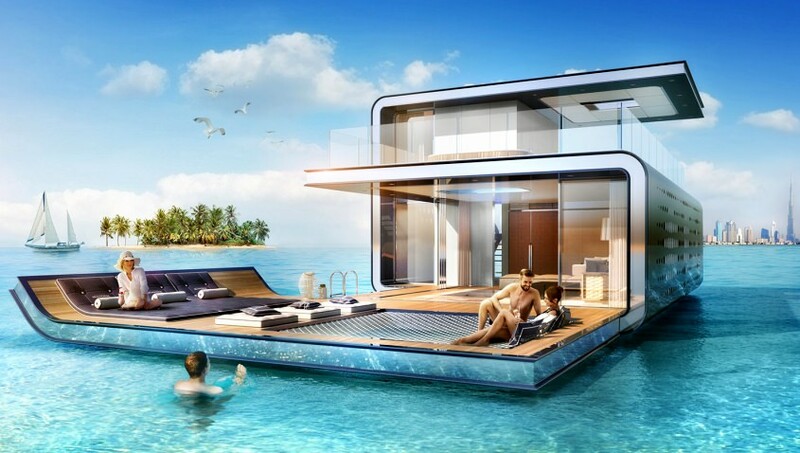 A total of 78 floating homes will be located at the man-made St Petersburg Island at The Heart of Europe resort. 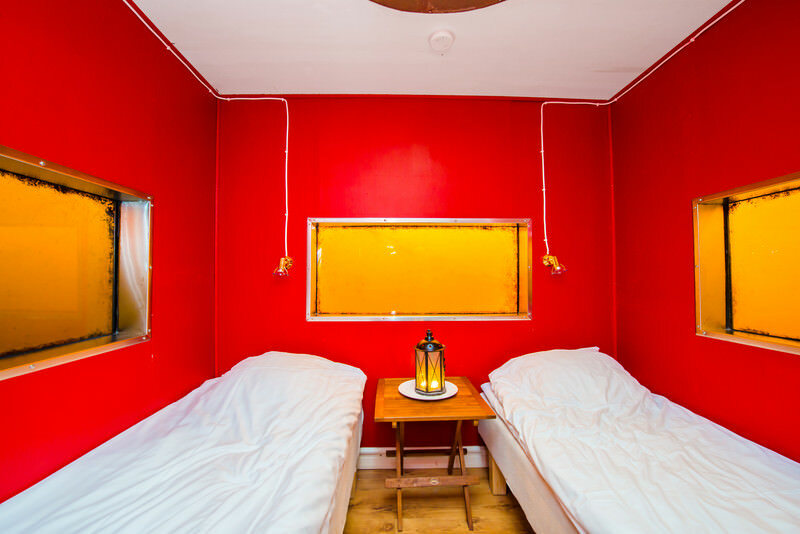 Hotel Utter Inn is neither a typical Swedish house nor the best hotel room in the town. Then what’s the catch? 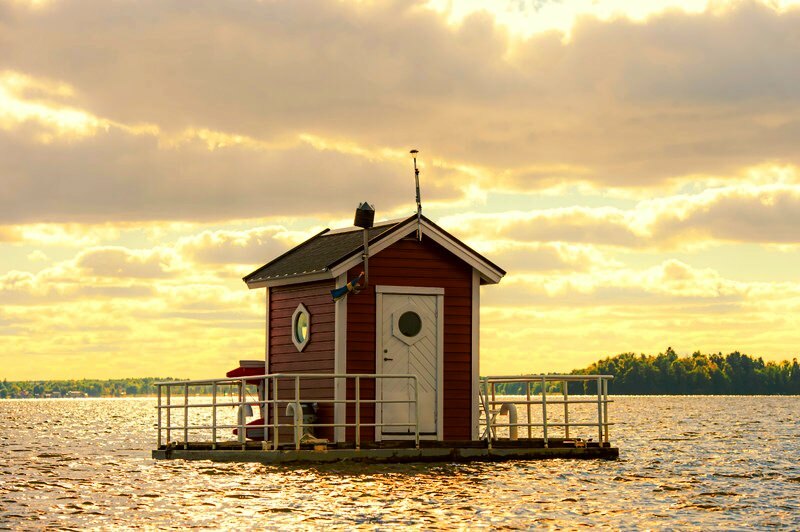 This unusual cottage floating on the surface of the Lake Malaren in Sweden has underwater accommodation. 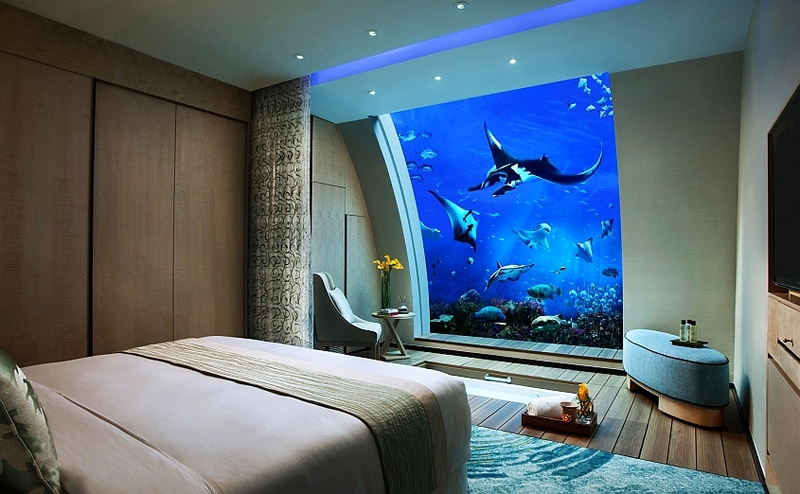 A ladder takes one down into an underwater room with windows to see creatures in the water. 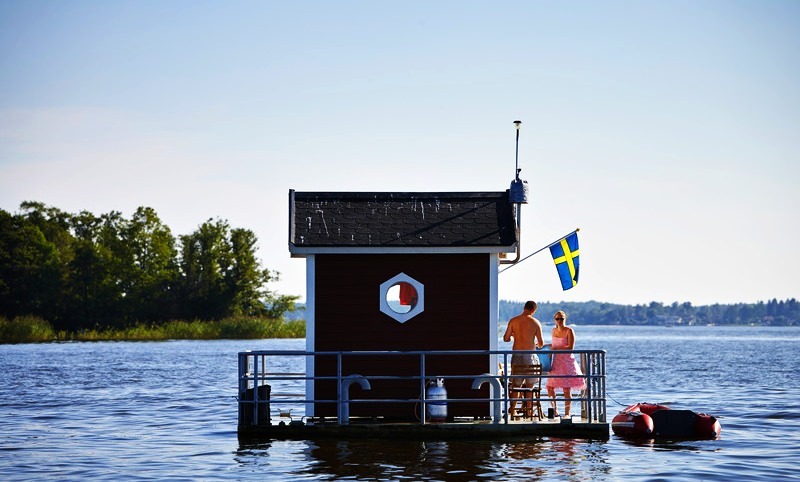 Originally, it is an art project by famous artist and sculptor Mikael Genberg. 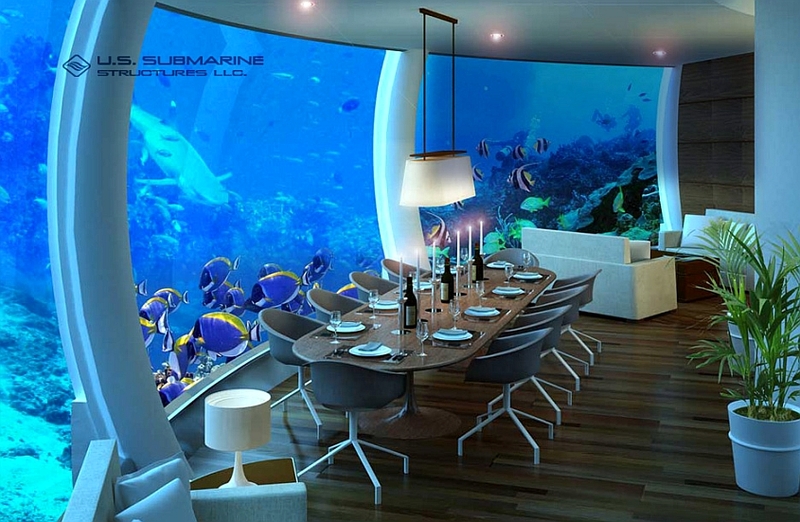 Poseidon Undersea Resort is a proposed five-star underwater hotel chain in Katafanga Island, Fiji. 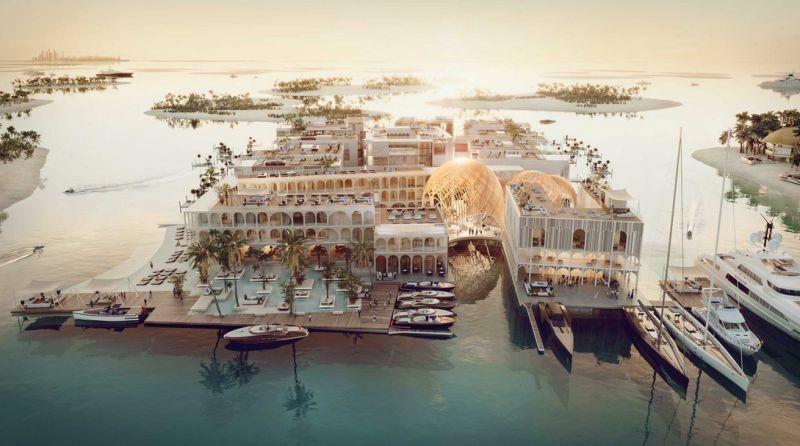 The resort will feature 24 guest rooms, an underwater restaurant and bar, library, conference room, wedding chapel, spa and a luxury suite. 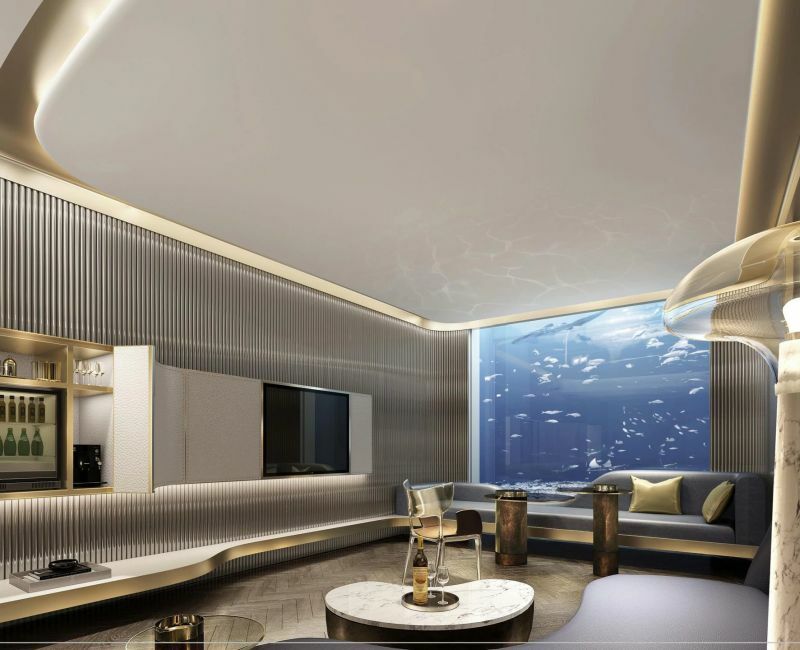 The guests will reach the resort through a specially designed elevator and will live in the underwater suites with aquatic animals around. 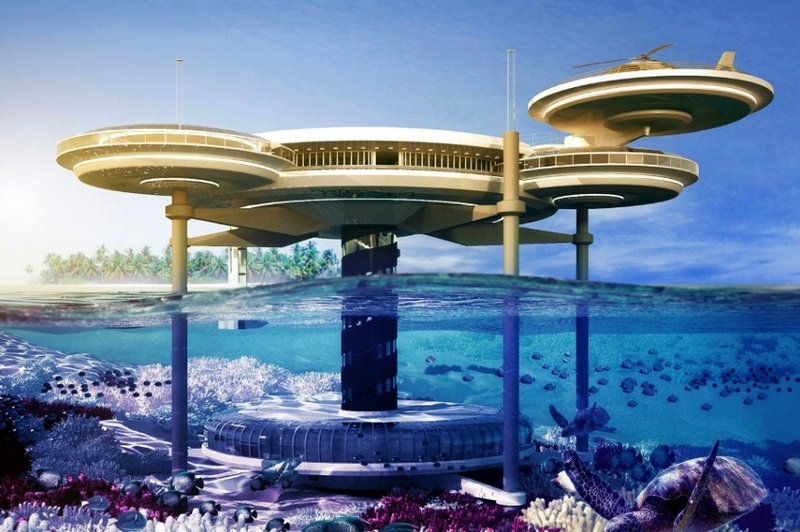 The Hydropolis Underwater Hotel and Resort is a proposed underwater hospitality project in Dubai. 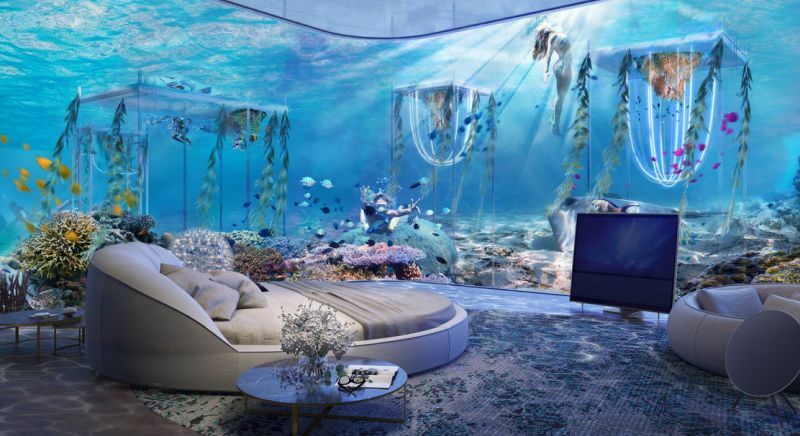 This $686-million project designed by Deep Ocean Technology is one of the most sophisticated and expensive hotel projects conceived ever. 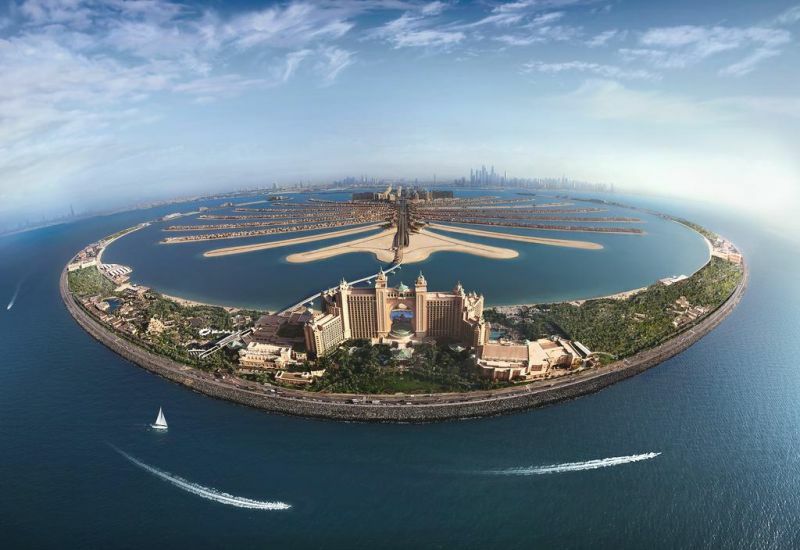 The hotel will be located 66-feet under the water in the Persian Gulf of Dubai, alongside the Palm Jumeirah. 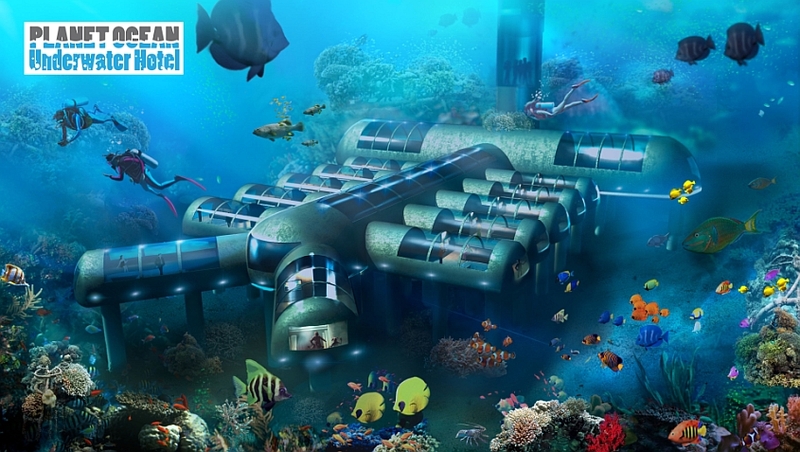 Designed by Joachim Hauser and Professor Roland Dieterle, it is planned to be composed of three segments: a land station, a connecting train, and the underwater hotel. 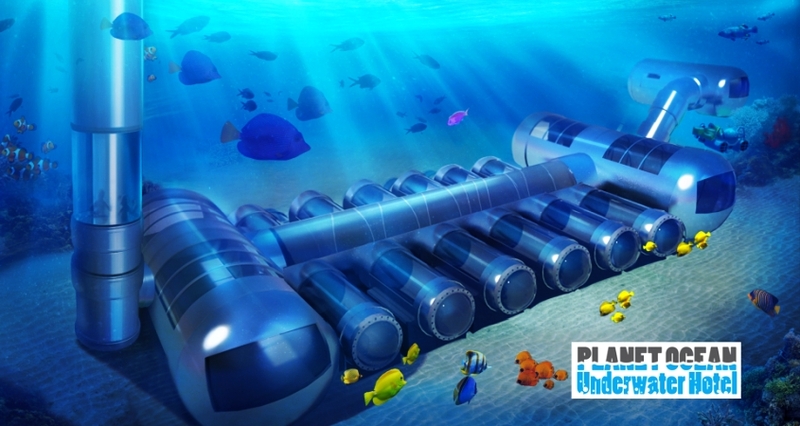 Istanbul is also waiting for a mega underwater venture. 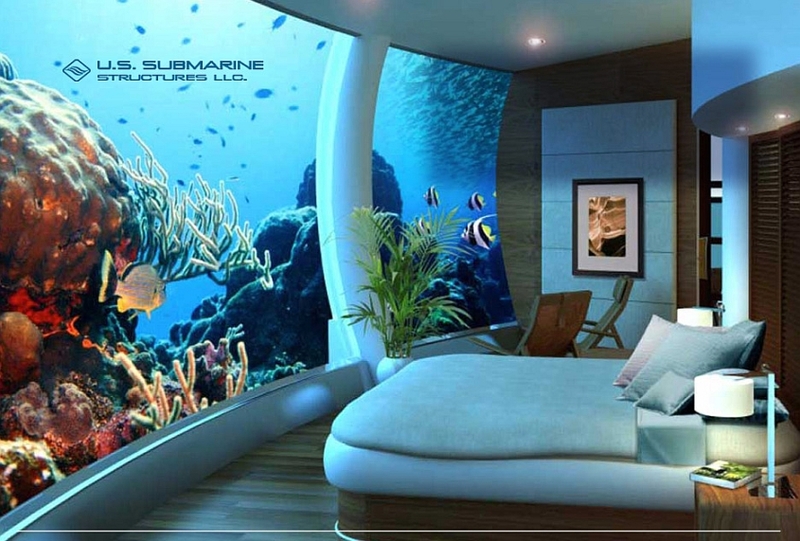 The idea is to build a subsea hotel in Turkey with seven layers of living spaces underneath the sea. 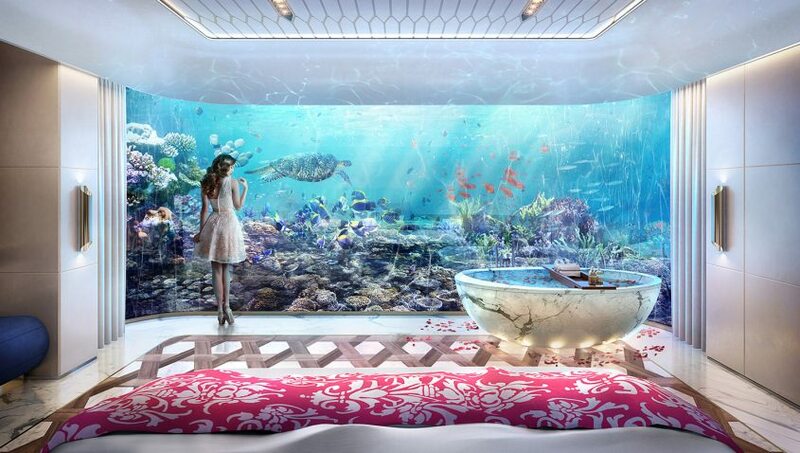 It is going to be the world’s first 7-star hotel featuring lavish underwater hotel rooms, leisure areas, exhibition halls, and state-of-the-art facilities. 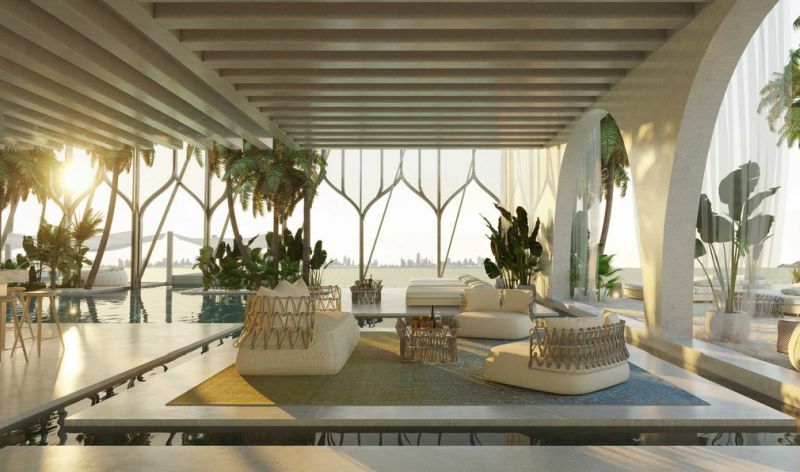 The project is said to be located on the ruins of a historical 1930s factory, with views of the Bosphorus Strait of Istanbul. 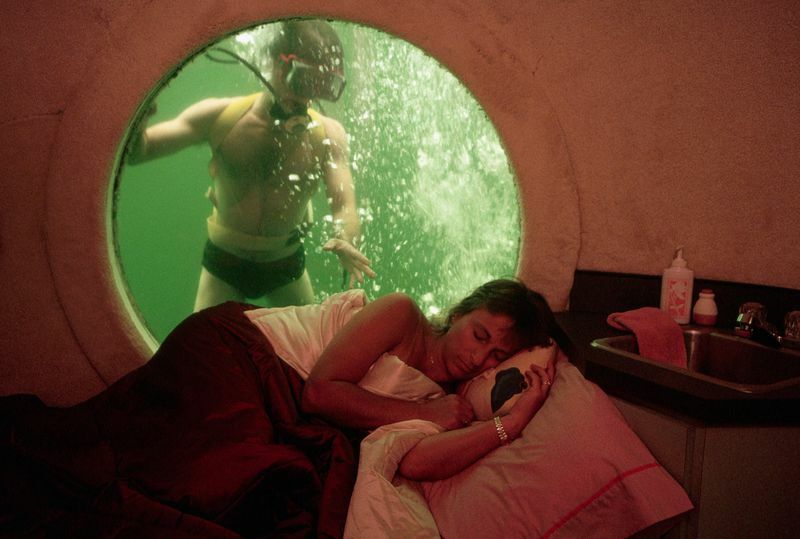 Lovers Deep is a submarine converted into a hotel for couples by Olivers Travels. 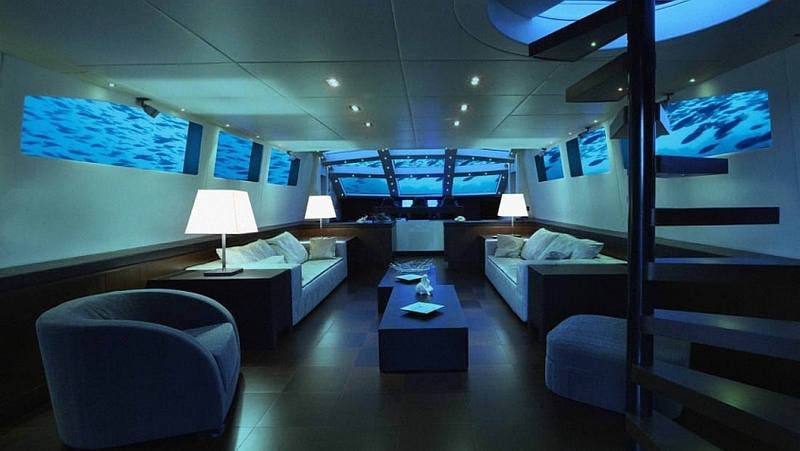 It is supposed to cater to people who wish to have an extraordinary and private time under the sea. 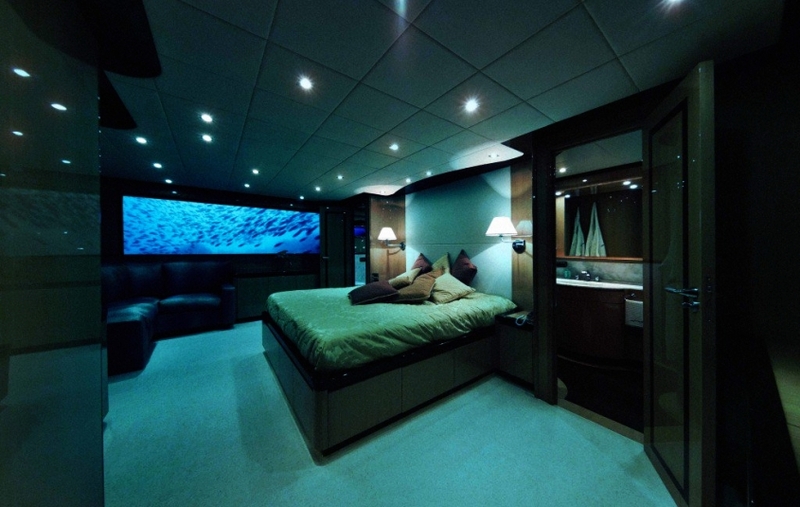 There are hotel-like features complete with luxury facilities on board to experience the marine world. 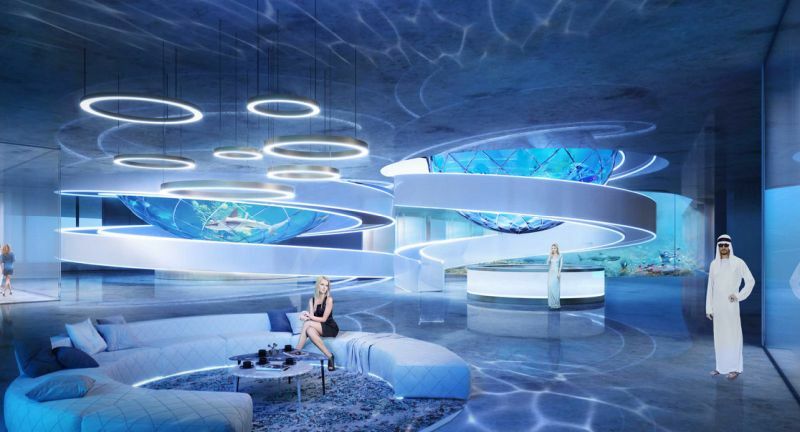 The Planet Ocean underwater hotel will be designed to offer exclusive underwater experience. 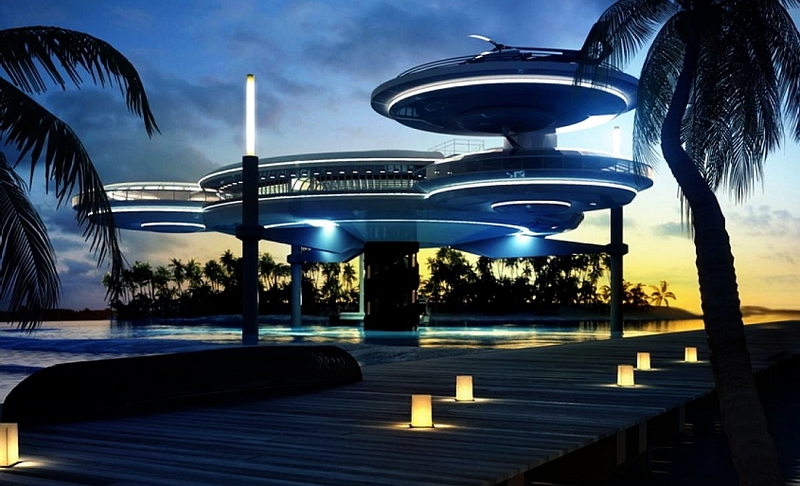 It will be a movable underwater hotel sited for 15 different locations around the Puerto Rican Island. 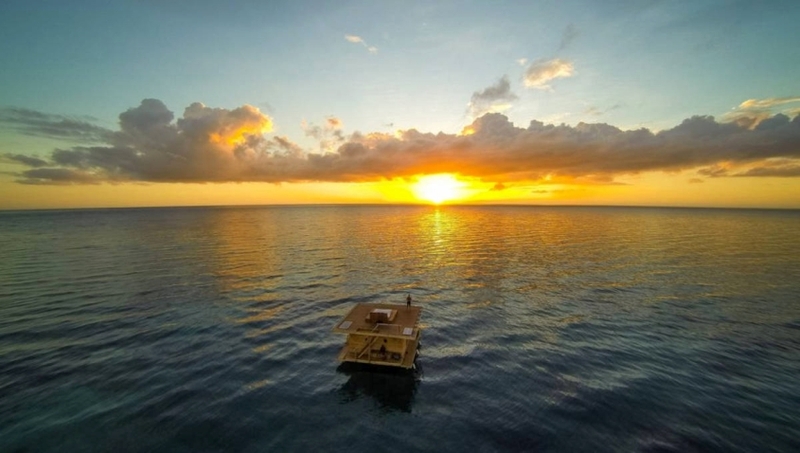 This getaway will be ideal for those adventurers, sea lovers and oceanographers wanting to experience what it is like to stay underwater. 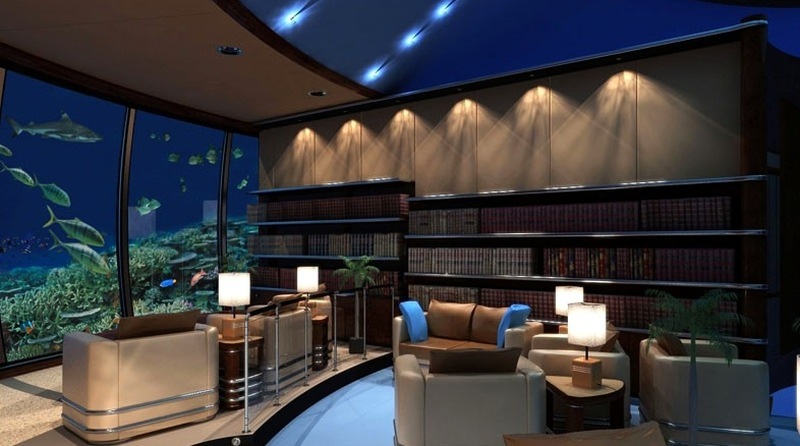 The underwater hotel is set to be the world’s first self-contained underwater luxury hotel. 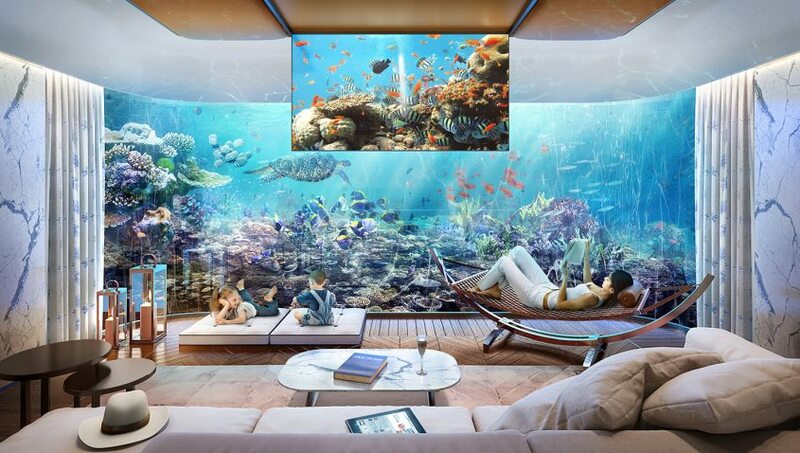 It will consist of capsule-shaped compartments that allow visitors to gaze at the stunning marine life and reef formations. 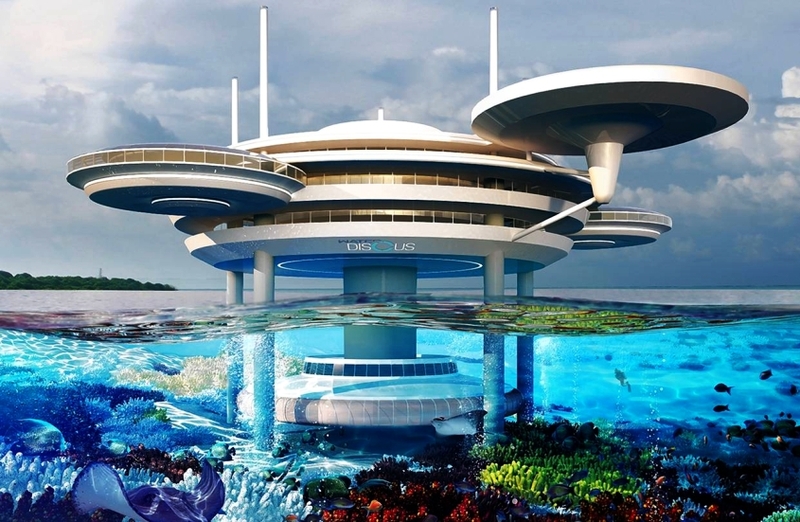 H2OME is conceptualizing an underwater living structure. 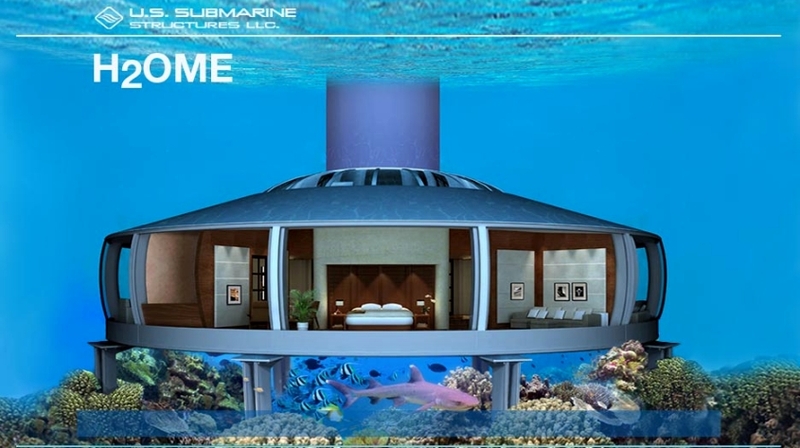 They have proposed an underwater residence that people can purchase. They will be offering options to choose the seafloor site. 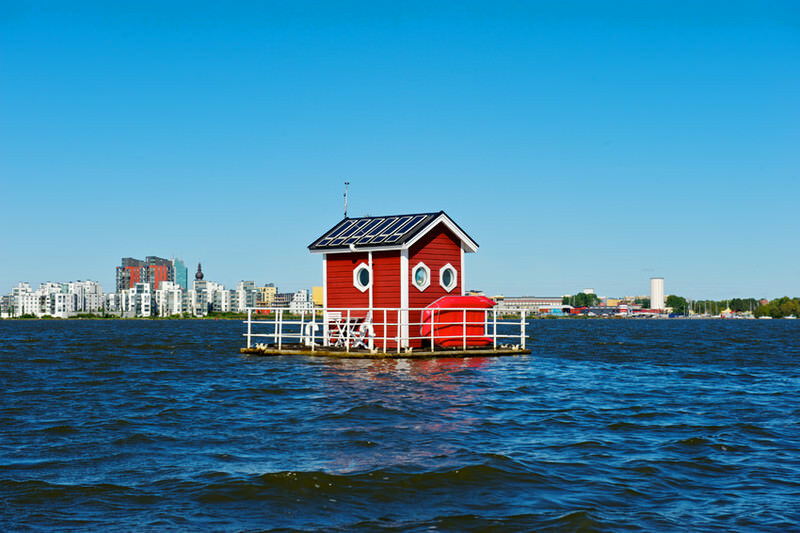 These homes sport the same entry points as the ones on the surface, so no diving or decompression is needed to enter this underwater residence. Yash, born and brought up in the Himalayas, holds a Master's degree in Journalism & Mass Comm. and has experience of over 7 years. He is passionate about finding new and amazing stuff online and spends most of his time exploring the infinite world of internet. He enjoys writing about a wide range of topics, including all things geeky and luxurious. You will find him doing workout or exploring the countryside when he is offline.